Preheat oven to 180 degrees fan. In a large bowl, beat butter, vegetable oil, sugar and maple syrup until smooth. Add vanilla and egg. Continue with adding the dry ingredients and stir. Carefully add carrots and chopped pecans. Using an ice-cream scoop, "drop" cookie dough onto baking sheet and bake for 8 minutes. Take out cookies and leave on baking sheet for another 2 minutes, then let them cool off completely on a rack. My husband adores carrot cake, so I bet he'd like these. Glad Pub quiz was fun. I love carrot cake though I'm a recent convert! These cookies sound fantastic. I'll have to try the recipe and I've always had good luck with anything from Lauren's Latest. 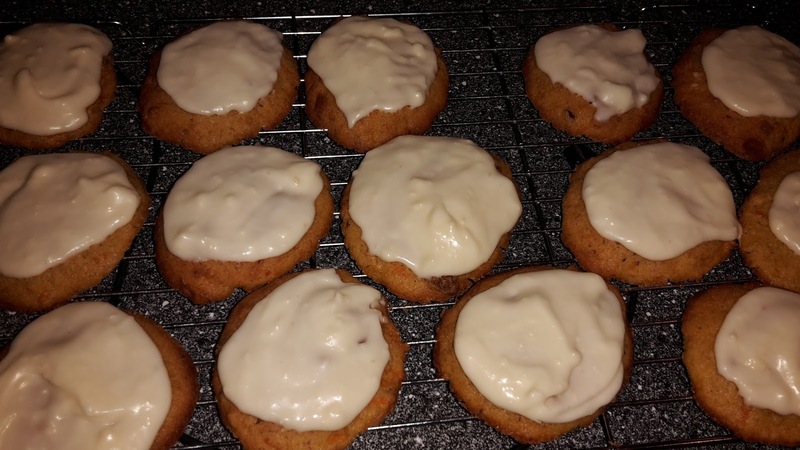 Carrot cake is yummy, I bet we'd all love these cookies. Show us a photo of the After Baking please! Will try these this weekend, David loves carrot! Just add carrots, and we can all think we are eating health food! Miracle. But sounds delicious.